A passion for social justice and a desire to affect U.S. foreign policy brought hundreds of students from Jesuit schools to the nation's capital for a three-day conference that offered attendees the opportunity to discuss how they can aid people in other nations suffering from violence and corruption in their own countries. 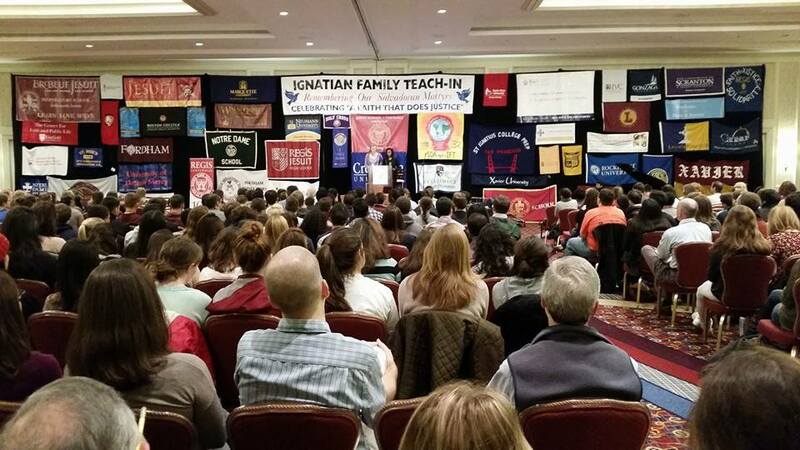 The 25th annual Ignatian Family Teach-In for Justice drew more than 1,300 people from Catholic universities, high schools and parish delegations to Washington Nov. 15-17. The event commemorates the November 1989 murders of six Jesuit priests, their housekeeper and her daughter during the Salvadoran civil war and offers people the opportunity to "learn, reflect, pray, network and advocate together," according to the Ignatian teach-in's website. Jesuit-run Creighton University in Omaha, Nebraska, sent one of the biggest groups to the event, with 50 students in attendance. On the last day of the conference, a small contingent from the group met with a staff member from the office of Rep. Adrian Smith, R-Nebraska, office as part of the teach-in's "Advocacy Day," when student groups meet with members of Congress to advocate for human rights in Central American countries that suffer from economic and political instability. "We can be the voice for the voiceless," Annie Townley, a Creighton junior, said in an interview with Catholic News Service. "We've met a lot of people and been able to do a lot of things. We've heard their stories, and we want to tell their stories. That's what we're passionate about as students." The Creighton students said they had three specific points of discussion they wanted to bring up in their advocacy meeting: U.S. foreign policy in Central America, immigration reform and environmental justice. Mike Rios, a graduate intern at Creighton's Center for Service and Justice, led his group in advocating on behalf of people in Guatemala, El Salvador and Honduras, where increased violence has caused many residents to seek refuge in the U.S.
"Because of the violence, people are fleeing and we're finding more and more people showing up at the border, not looking for economic prosperity but looking for safety," he said. "It's less about immigration reform in America and more about the policy of what we're doing to help out with the situation in the origin country." The 1989 murders of the Jesuit priests, their housekeeper and her daughter incited a fierce discussion among Americans about U.S. foreign policy when it became known that members of the army unit that committed received training at the former School of the Americas in Fort Benning, Georgia. The school, now called the Western Hemisphere Institute for Security Cooperation, trains military leaders from across the Americas. Graduates have been linked with human rights abuses across Latin America, opponents of the school seek to have it closed. Rios said he hopes political leaders will recognize that giving support to foreign militaries "can often just propagate the violence." "We're asking them to invest in programs like women's shelters that can take care of people who are victims of sexual abuse and violence, programs that work ... for rehabilitation of gang members (and) social projects within the countries," Rios said. In meeting directly with the politicians, the students said they felt they were doing more to serve the people of Central America. "For us it's not just enough to go out and serve and do service for the sake of it and volunteer; we want to do something to tackle the social structures that create injustices," Nico Sandi, a senior, said. "The way we'll learn how to do that is to go out and advocate and talk to the people in power and ... see what they can do to the help the people that are suffering from injustices." Soo Kim, an exchange student from South Korea who studies international relations, said she enjoyed learning about the political implications of U.S. foreign policy and seeing how students here acted on issues they care about. "I thought this event was so cool because this is a way of expressing your rights. It's so impressive to me," she said. "In my country, I didn't know how to exercise my rights. It's not usual; maybe we could do petitions, but, as a college student, there (are not) events like this. I was impressed by all the students." Freshman Ed Nunez said the conference, and hearing from keynote speaker Jesuit Father James Martin, whom he called "one of my favorites," made him "excited and hopeful for ... what the future holds." "(Students) are ... in my opinion, the future of the world," he said. "I think we need to make our voices be heard to people who are leading us right now and make that change and then hopefully better things can occur from that." This is a great article, but please note that the very first word in the title, "Ignatian" is spelled "Iganatian" with an extra "a"!